The polyethylene family of plastics consists of several grades, including high-density, low-density, marine, food cutting board and playground. They have varied uses but share many of the same characteristics: low moisture absorption, exceptional chemical and corrosion resistance, and low cost. Applications include chute liners, bearing pads, bushings, cutting boards, machine parts and storage tanks. LDPE is a corrosion and chemical resistant, extruded material with low moisture absorption. It is further characterized by its toughness, flexibility, and low-temperature impact resistance. LPDE is easily fabricated, vacuum-formed, and welded. It is resistant to stress-cracking and often used for transporting water and chemicals. It also meets FDA food processing guidelines. HDPE is a high-impact-strength, polyethylene that exhibits excellent tensile strength, energy absorption, abrasion resistance, and resistance to stress cracks. Compared with low-density polyethylene, this material offers better corrosion resistance, a higher working temperature range, and higher tensile strength. It also is lightweight and does not absorb moisture. This material is ideal for the manufacture of chemically resistant products and meets FDA and USDA food processing guidelines. Marine grade HDPE is formulated to meet the specific requirements of marine and other outdoor environments. Special postproduction treatment enhances its ability to withstand the effects of salt water, moisture, and direct sunlight. Like regular HDPE, this material exhibits high impact strength as well as excellent tensile strength, energy absorption, abrasion resistance, and resistance to stress cracks. In addition to its resistance to marine and other outdoor conditions, Marine grade HDPE has a decorative, textured surface that does not show wear, dirt, or scratches and is available in a variety of colors. Marine grade HDPE is manufactured as a continuous extrusion therefore, it is guaranteed not to delaminate during the service-life of the end-product. It also meets FDA approval for direct food contact. Food cutting board is a premium HDPE material with a surface that is gentle on cutting blades. Cutting board is used in a wide array of applications—from home use to commercial food preparation and in some of the largest packing plants in the United States. Sanalite® is available in two formulations: high density polyethylene (HDPE) and polypropylene. Polypropylene has a harder surface than HDPE. Both come in natural (white) color. Some additional colors are available in HDPE. Playground board is the choice for the most durable, colorfast product for outdoor recreational use in extreme weather conditions. It is environmentally stabilized to resist moisture and damaging UV rays and is available in a variety of primary colors. The range of sizes and shapes are grade specific, please contact us for more information. 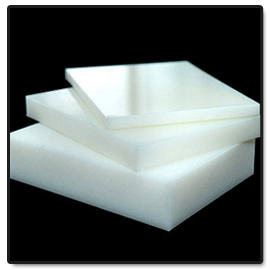 The polyethylene family of plastics consists of several grades, including high-density, low-density, marine, food cutting board and playground. They have varied uses but share many of the same characteristics: low moisture absorption, exceptional chemical and corrosion resistance, and low cost. Applications include chute liners, bearing pads, bushings, cutting boards, machine parts and storage tanks.